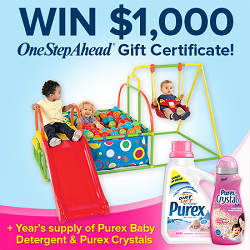 One grand prize winner will receive a gift certificate valued at $1,000 from One Step Ahead®, a year’s supply of Purex® Baby Detergent, and a year’s supply of Purex® Crystals™ for Baby. Enter HERE. This giveaway will end July 31st, 2014 at 3:00pm PST.